Posted by judylobo in Baby Animals, Birds, Mammals, Mongoose, Nature, photography, Polar Bears, Snow Leopard, Wildlife, Zoo. A visit to the Central Park Zoo always brings something new. Check out the three week old adorable Mini Nubian goat named Spot. 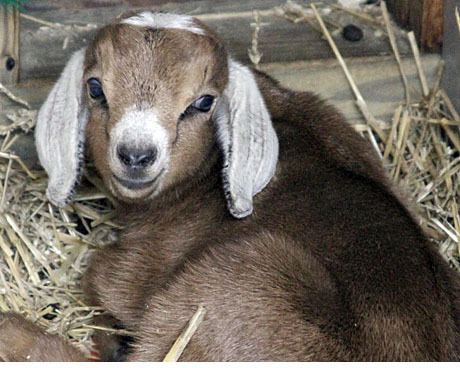 He resides at the Tisch Children’s Zoo with his mother, Monique and several other goats. Mini Nubians are a cross between Nigerian dwarf and full-sized Nubian goats. If you get lucky you might also see the new Peregrine Falcon, Sierra, as she strolls around the Central Garden with one of her handlers. Go to the Tropic Zone to warm up and you will see six new Whistling ducks in the beach area along with two White-winged Wood ducks. Look further in the Temperate Zone for our new cranes as well. Come visit soon. To see these photos larger, click here. If you did not pick up your Happy Holidays card from Casa Lobo to your house please click here. You can get to see my adorable (and cooperative dog, Benny along with my not so cooperative cat, Madison).